Eventful Conferences is running a Cyber Monday competition. What’s better than Huntington Beach in February? 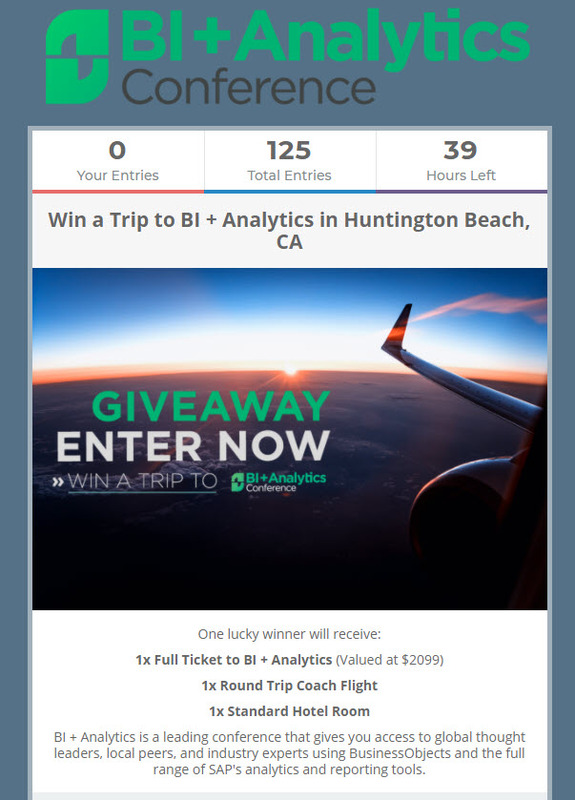 The BI + Analytics Conference will be in Huntington Beach in less than three months (February 19-21st). This year Eventful Conferences is producing the event. It will be the 11th year ASUG has held this event; it began back in 2008 at the Hilton Anatole in Dallas. Be sure to check out the conference brochure. The conference producers give you 5 great reasons to attend. This conference is known for its hands-on sessions, and this year is no exception. There are hands-on sessions for Predictive Analytics, Lumira Designer/Discovery, and more. Last year the sessions were completely full, with waiting lists. You can see my wrap-up from last year here. You can see all the speakers here. Some are from SAP but many are customers telling and sharing their stories. You can also check out the agenda here or download the whole schedule here. Why else should you consider attending?